S (M, L). Unisex, sizing is given in both men's and women's US shoe size. 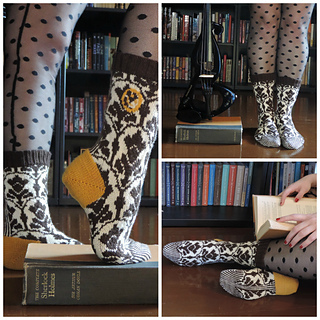 Just because you’re a high-functioning sociopath is no reason to skip the fun socks! 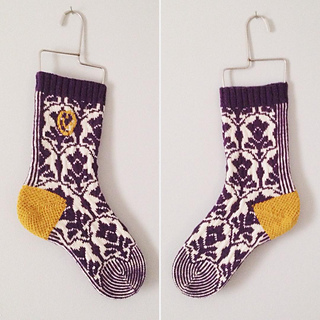 Knit in the round, with adjustments for 3 sizes, these socks can be enjoyed by men and women alike. This is an intermediate-advanced knit perfect for someone comfortable with making socks and following a color chart. Finished Size (Blocked): S (M, L) Please note that sizes are US shoe sizes! Yarn: Valley Yarn Huntington Superwash Sock Yarn: 1(2, 2) balls Chocolate (Color A); 1(2, 2) balls Natural (Color B); 1 ball Mustard (Color C). Needles: US 1 36” circular needles for working in magic loop. Notions: Stitch Markers, stitch holder, tapestry needle.